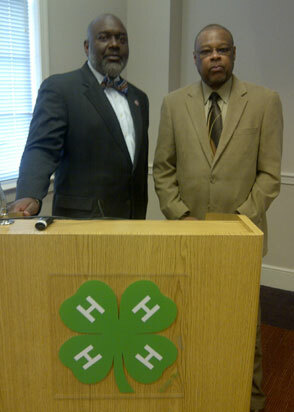 On Wednesday, March 5, 2014, Dr. Delbert Foster, South Carolina State University, and L. Washington Lyons, Administrator of the 1890 Association, met with staff at the National 4-H Council to review the rich history of the 1890 Land Grant Institutions.One of the outcomes of these discussions was the need to document and share the rich 1890 history using 21st century media. In the coming months, the 4-H History Preservation team and the 1890 leadership will explore joint activities for getting 4-H youth involved in helping 1890 4-H alumni to document the Extension and 4-H memories.Continued discussion with Georgia 1890 4-H leader, Woodie Hughes, and others will design efforts where 4-H youth will produce some multi-media products that will document 1890 4-H History. This entry was posted in History and tagged 1890 Association, Delbert Foster, L. Washington Lyons by Tom Tate. Bookmark the permalink.